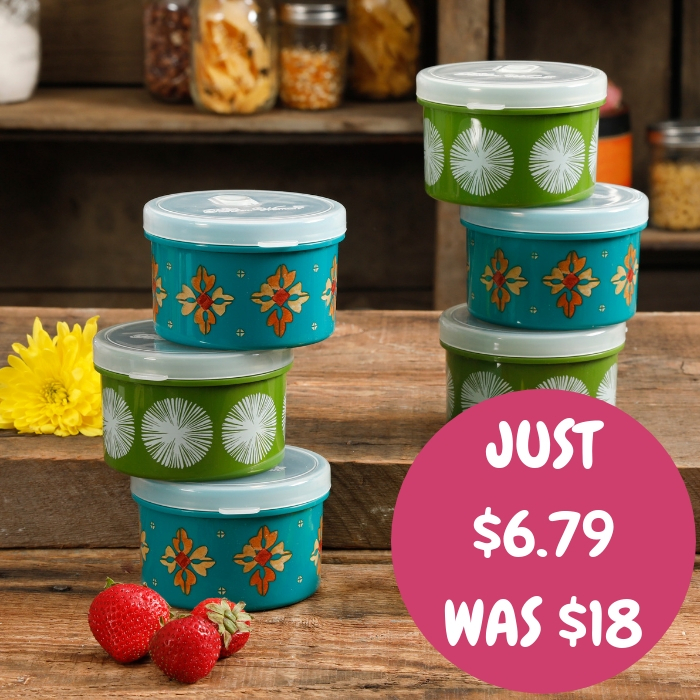 Round Container 6-Piece Set Just $6.79! Down From $18! At Walmart, you can score The Pioneer Woman 13-oz Round Container 6-Piece Set for just $6.79 down from $17.97 PLUS FREE shipping for orders $35 or more! The Pioneer Woman Flea Market 6-Pack 13 oz. Small Container set is as versatile as it is beautiful! These small containers come with matching, spill-resistant lids, which makes them convenient for everything from kitchen storage to handy helpers around the house. Whether youre storing small amounts of food in the refrigerator or using them to keep buttons and sewing equipment organized, youll reach for these containers every day because they are just so useful. These small, round containers feature Rees signature floral pattern that fans have come to love, as well as vibrant backgrounds of blue and green. This set is both decorative and functional, especially when used for food storage as they easily keep hot food hot and cold foods cold. Additionally, these round containers have built-in vent tabs that make reheating easy. This set is also dishwasher safe. Bring rustic elegance home with the Pioneer Woman Flea Market 6-Pack 13 oz. Small Container set. Rectangular Containers 4-Piece Set Just $9.97! Down From $20! 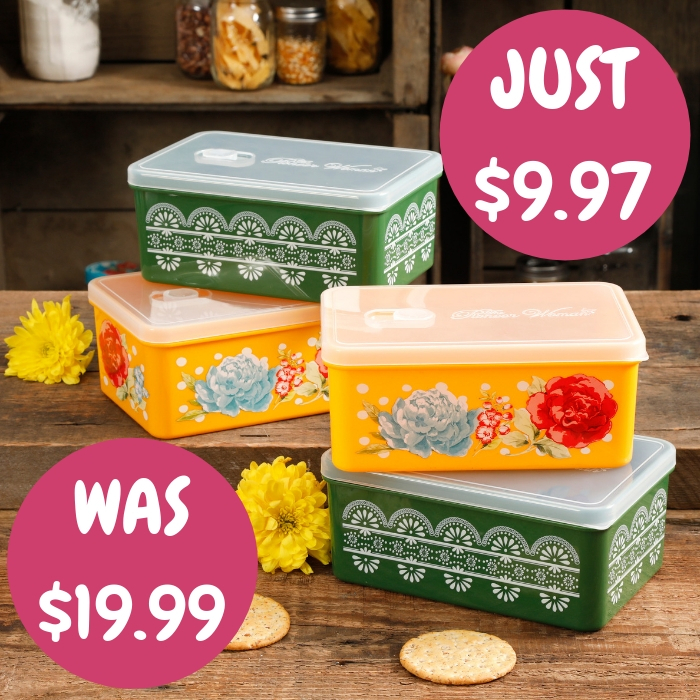 Head over to Walmart to score The Pioneer Woman Rectangular Containers 4-Piece Set for just $9.97 down from $19.99 PLUS FREE shipping for orders $35 or more! The Pioneer Woman Flea Market 4-Pack 68 oz. Rectangular Container set is as beautiful as it is functional! These helpful storage containers are perfecting for packing all your favorite lunches to-go while helping to keep food fresh and tasty. Available in vibrant colors like yellow and green and adorned with Rees signature floral pattern, this container set is ideal for on-the-go meals. Keep hot and cold foods in the spill-resistant containers until you are ready to eat. The rectangular container set features secure lids and built-in vent tabs for easy reheating. This convenient addition to your kitchenware and storage collection is convenient for storing leftovers, transporting your culinary creations to and from gatherings of friends and family and more. These items easily match with other items from the Pioneer Woman Flea Market Collection. Make the Pioneer Woman Flea Market 4-Pack 68 oz. Rectangular Container set the latest addition to your country kitchen! 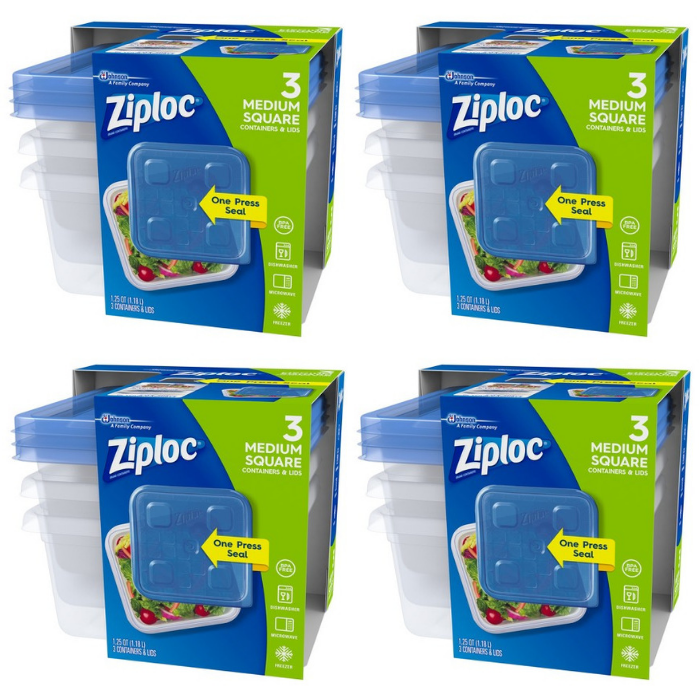 Ziploc Containers Just $0.48 At Walmart! You can get this great deal at Walmart! Ziploc Containers for just $$0.48!